John Biggin was born in 1708, possibly in Whitehaven. 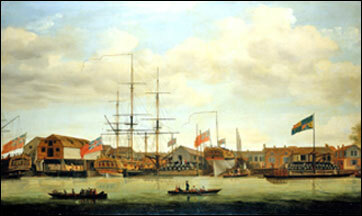 His father was William Biggin, and together William and John traded goods by ship to and from London. By 1749 John was living in London and a son, John Biggin, was baptised at Holborn, but died a year later. Their daughter Mary Anne was baptised at Holborn in 1752. By 1753 the family were based in Lambeth, where another John was born and died in infancy, and where their two sons Robert and George lived as children. 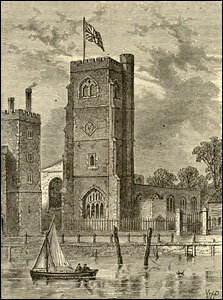 They lived on the Thames near where the London Eye is today, and could have travelled to the church of St Mary at Lambeth along the river. John Biggin was a coal factor with property in the parish of St Mary Lambeth, near to Billingsgate dock, where “Sea-Coal” was imported. By 1769 he lived in Belvedere Road in London and was leasing a piece of ground called The Hopes, on what is now the South Bank, broadly where Jubilee Gardens is today. John’s London properties extended across to Rotherhithe. The Biggin family continued to hold this property until 1800 in addition to their Cosgrove estate. They also held property in Essex, Higham Hills. According to “The British Navy, Economy and Society in the Seven Years War” by Christian Buchet (2013), John built up a fleet of around 25 ships, trading from the Billingsgate docks all around the Atlantic seaboard. By 1756 Britain was fighting the French in the Seven Years War. John Biggin obtained the largest number of contracts for provisioning the fighting ships of the Royal Navy of any merchant, due to contacts in Ireland, Canada and Carolina. His ships would sail out to the war galleys, deliver fresh food, vegetables and large amounts of brandy, and get a receipt from which John Biggin would be paid by the Victualling Board. At this time John had personal access to the Lords of the Admiralty, such was the importance to the Navy of his Victualling business. By 1768 it has been estimated that John’s business was worth £1,543,433. Voyage 77834 Ship: Ann Gally (1760) Built in New England. Owner : John Biggin. 272 tons. 4 mounted guns. 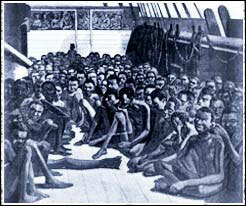 Bought slaves in Senegambia and traded them in Charleston and St Louis from 12 July 1760. Set sail for London 13 Sep 1760. Crew of 12 men. Captain Joseph Webb. Embarked 251 slaves. Arrived with 211. The Seven Years War finished in 1763 and John Biggin bought the Cosgrove Manor estate (now called The Priory) in 1764. He was 56 years old. John seems to have left all the management of his Cosgrove responsibilities to his son-in-law, Mary Anne’s husband, John Christopher Mansel. Rev W Cole of Bletchley gives this account in his Diary of a dinner held for Dr Pulter Forester, Rector of Cosgrove and Passenham, and who in 1767 was Chancellor of the Diocese of Lincoln. All the local gentry were invited to meet him. I went to dinner on a Turtle of about 80 pounds at the Bull at Stony Stratford at an Ordinary for the neighbouring Gentry, given by Mr Bigging [Biggin] of Cosgrove to Dr Forester, who gave it to the Public; by which he avoided the expense of a large company at his own house. It [the Turtle] was very well dressed, with an Elegant Dinner, by Mr Knightley’s cook of Fawsley. Cards after dinner. The Company about 50, viz, Mr and Mrs Knapp of Little Lynford, Mrs Uthwatt of Great Lynford and with her Lawson Shann and his two unmarried sisters, Mrs Shepherd of Litcot and her 2 sons, Mr Robin Lowndes of Great Brickhill with Mr Pitts of the same, Miss Clara Lowndes of Astwood Bury, Dr and Mrs Forester, Mrs Bigging and her daughter [Mary Anne], Captain Mansell, Captain Rigby and his sister with Mr Mackanasse of Haversham, Mr and Mrs Shipton and their Daughter of Stanton-Barry, Mrs Ecklass, Mr Sabyn of Perry and his Daughter, Mr Hammer of Simpson, Dr Dayrell of Lillingstone Dayrell, Mr Arnold Rr of Perry, Mrs Deane of Cosgrove, Widow, Mr and Mrs Wilmer and Mr Bloxham with Mr Bradbury, all of Stony Stratford, Mr Smith of Wolverton, and others I cannot recollect. I got home about 8 o’clock. Apparently he did not stay for the ball which followed. 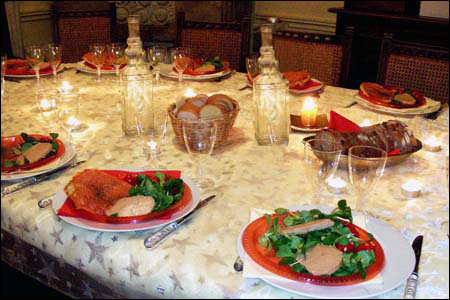 The picture above shows a proper turtle dinner - still served in the US, as in the Charboneau Reveillon Christmas Eve dinner. John paid his way  as evidenced by his contribution listed on the subscription board in the church porch. He paid £50 towards the grand re-furbishment of the Church by Pulter Forester in 1771. John and Eleanor Biggin lived at the house now called The Priory and were eventually buried in Cosgrove, although Eleanor owned property and businesses in London after John’s death in 1775 and appears to have continued with some of the businesses until she died in 1788. In an early will John provided for Mary Anne, then 23 and left the remainder to Eleanor, Robert (20) and George (15), Robert being the main heir. John’s eldest recorded son, Robert, was a black sheep in the family despite being the heir. Robert raced his horses Maid of Orleans and Dunvis at Northampton and was a Steward at the racecourse from 1778 when he was 23. John Biggin eventually left his Cosgrove estate to Robert’s younger brother George in 1778, and it is assumed that this was because Robert was deemed “incompetent”. On 19 June 1779, when Robert was still living in Lambeth, at the property now owned by his mother Eleanor, his creditors were invited to claim their debts of him on the liquidation of his assets. Robert apparently died in Brabant, near Brussels, Belgium, reported in the Gentleman’s magazine of July 1784.